Eight hundred bottles of anabolic steroids and human growth hormone were seized during a drug bust in the Canadian province of Alberta last week. 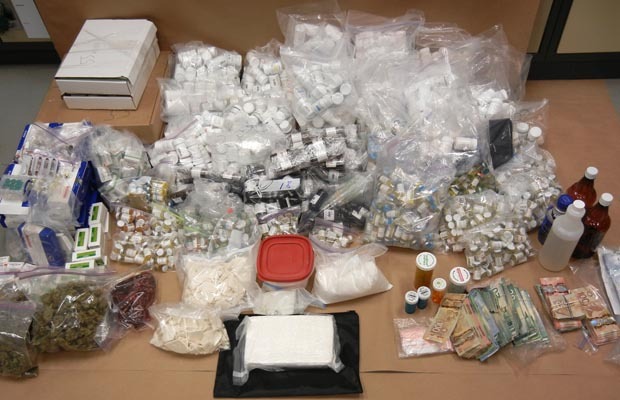 A veritable smorgasbord of various recreational drugs were also found during the raid of an upscale home in Fort McMurray. Wood Buffalo’s Combined Forces Special Enforcement Unit (CFSEU-Wood Buffalo) executed the search warrant on December 12, 2012. The CFSEU-Wood Buffalo is a unit of the Alberta Law Enforcement Response Team (ALERT). In addition to steroids and hGH, law enforcement officers seized 1,000 prescription pills, 400 grams of marijuana, 400 grams of hashish, three liters of gamma hydroxybutyric acid (GHB), 993 grams of ecstasy and $300,000 worth of cocaine. In total, the seizure was estimated to have a street value in excess of $750,000. Richard Cosman and Jeromy Laporte were each charged with eight counts of possession for the purpose of trafficking and one count of possession of proceeds of crime over $5,000. A decade ago, anabolic steroids and performance-enhancement drugs (PEDs) were still illegally sold on the black market. But the dealers of these PEDs generally focused exclusively on drugs used by athletes to enhance muscle, strength, size and endurance. However, as the war on steroids intensified with sentencing for steroid crimes becoming more draconian, the sale of anabolic steroids was pushed further and further underground. The recent drug bust in Alberta is a reflection of the changing nature of the underground steroid market. No longer is the androgen black market dominated by bodybuilders who went into business to provide steroids to other bodybuilders and like-minded athletes. Steroid sales are now increasingly more likely to appear on the product lists of traditional drug dealers who sell cocaine, ecstasy and marijuana. This probably means that, in the future, we will likely see more and more drug busts that include anabolic steroids as one component of an underground business primarily devoted to the sale of recreational drugs.